The attractions at the Gulf Shores have been built to occupy and excite visitors of all ages, but what drew people to the shores originally was the incredible natural beauty of the area. The sparkling waters create the perfect home for a huge range of wildlife, and nature lovers can feel right at home in this area. One of the best places to see wildlife in its natural environment is the Bon Secour National Wildlife Refuge. It is an area of 6,700 acres that was established to provide a safe home for migratory birds, nesting sea turtles, and even the endangered Alabama beach mouse, among other various creatures. Despite its relatively small size compared to other wildlife refuges, Bon Secour regularly elicits wonder and awe in its 100,000 annual visitors. You haven't seen the color of butterflies in all their glory until you've seen the massive monarch butterfly migration. Just like birds, monarch butterflies regularly fly south for warmer climates in the winter months. Every September and October, watch as the butterflies traverse the Alabama coast as part of their 3,000 mile journey to more hospitable climates. In March and April, you can see them make the return trip. 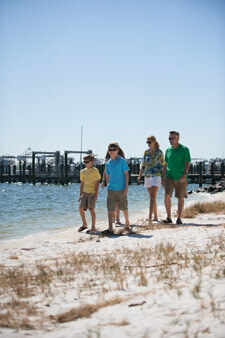 Check out our Gulf Shores rentals to make sure you don't miss it. If you're hoping to get up close and personal with the animals, you can't miss Alabama's dolphin experience. You and the family can book a dolphin cruise to seek out these gentle creatures. The dolphins are safely in their native habitat, and you can watch how they interact with each other and with the visiting boat. The Gulf is home to 20 species of whales and dolphins, and even one species of manatee, so there's no limit to what you can see. Orange Beach and the Gulf Shores provide an incredible opportunity to commune with nature while enjoying a spectacular vacation. The unique natural environment combined with the various enterprises that have sprung up to help visitors explore every facet of the Shores makes it easy to turn this getaway into an unforgettable experience.